Derry City's Europa League adventure came to a disastrous end at the hands of slick Danish outfit Midtjylland at the MCH Arena in Herning. The Danish men hit City for six and in fact could have won by a far bigger margin. Midtjylland's pace and power in the end was too much for City to handle, with Simon Kroon, Jakob Poulsen and Rilwan Hassan proving to be a real handful. The understrength 'Candy Stripes' gave their all and in youngster Ronan Curtis, they had a man who never gave up and capped off a fine display by firing home a consolation goal. As expected both Barry McNamee and Conor McDermott missed out through injury, however both players were on the bench, meaning that Ben Doherty and Rory Holden got their first taste of European football. The Danes gave debuts to recent signings, goalkeeper Jesper Hansen and Hungarian international Zsolt Korcsmar. And Derry got off to the worse possible start as they fell a goal behind on three minutes. The impressive Simon Kroon was brought down on the edge of the box by Nicky Low and Jakob Poulsen's resulting free-kick found Marc Dal Hende at the back post and he powered his header home from close range. A minute later the lively Rilwan Hassan got in behind Ben Doherty, but with only City keeper Gerard Doherty to beat, he side footed wide. Moments later Nathan Boyle easily skipped away from Dal Hende, but his stinging drive hit the side netting. Midtjylland with their fourth set-piece led to their second goal as Poulsen's right wing corner, despite miss hit, found Kristian Riis who after getting away from Harry Monaghan, he turned the ball home from six yards. Despite the shocking start the visitors slowly got into the game and they had another half chance on 25 minutes this time Nicky Low's left wing free-kick fell to Rory Patterson on the edge of the box, but his strike was straight at Jesper Hansen. The home side had a super chance to add a third as the dangerous Hassan picked up possession before feeding striker Paul Onuachu, but the big front man was denied by the out-rushing Doherty. On 41 minutes Dal Hende's left wing centre found Onuachu, but the front man's close range header, which had Doherty beaten, hit the crossbar. Right on the stroke of half-time the game and tie was over as a contest as Hassan picked up the ball after Ben Doherty's sliding interception fell to the Nigerian, who in turn feed Onuachu and the centre-forward was brought down inside the box by the out-rushing Doherty and Poulsen made no mistake with the resulting penalty, slotting the ball home. City should have had a penalty right at the start of the second half as the dangerous Curtis, who tormented Andre Romer throughout the first half, was brought down inside the box, but referee Markus Hameter waved play on, much to Kenny Shiels' frustration. Just after the hour mark the home side added a fourth goal as Del Hande's sublime left wing pass in-behind Harry Monaghan, found Simon Kroon and the winger from a tight angle diverted the ball home past the out-rushing Doherty. Two minutes later that man Kroon was teed up for his second goal of the night and Midtjylland's fifth goal as Hassan played the ball back for the midfielder who slotted the ball home past Doherty. Credit to the visitors they scored a consolation away goal on 65 minutes as Boyle slide in to win possession from Riis inside the six yard box and Curtis was on hand to fire home the loose ball. Doherty had to make two top draw saves to deny Kroon twice, as the midfielder had great chances to complete his hat-trick. 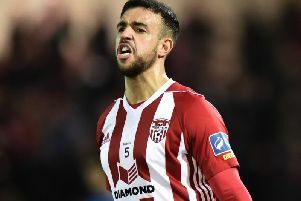 Derry were inches away from scoring a second on 74 minutes as Aaron McEneff's powerful 35 yards, which had Hansen beaten, clipped the top of the bar. On 80 minutes Poulsen nearly scored the home side's sixth goal, but after some champagne football, the midfielder's 20 yard drive, which had Doherty beaten, hit the post. Doherty could do nothing on 85 minutes as substitute Bozhidar Kraev drilled the ball home from 20 yards, after Kroon's initial shot was charged down. Midtjylland: Hansen, Romer, Riis, Korcsmar, Dal Hende; Sparv; Drachmann (Wikheim HT), Poulsen; Kroon, Onuachu, Hassan. Derry City: G Doherty, Monaghan, Barry, Jarvis, B Doherty; Boyle, McEneff, Low, Holden, Curtis; Patterson.